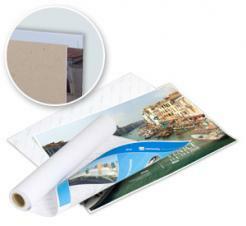 Fastbind's cover tacking material allows you to print the cover graphics with your digital laser or ink jet printer. With the glue/liner embedded into the material, once your done printing you are now ready to make your custom hard cover, CD case, 3 ring binder or other hard cover/case product. Available in sheets or rolls in multiple sizes, Fastbind has the the best quality and the size you need, in stock today! For more information on how to make a custom hard cover, see the Fastbind Casematic hard cover maker (click here)! Make Your own Custom printed hard cover case's with Fastbind's cover tacking/print sheets!